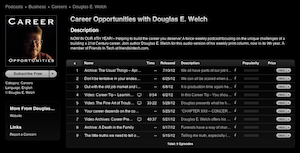 As you may have read a few weeks ago, when Apple released its new Podcasts app for iOS devices, I discovered that my long running podcast, Career Opportunities, had disappeared from the iTunes Podcast Directory. When I looked at the listings for my other podcasts, I noticed that they seemed to be having issues updating their information and logo graphics. When I tried to re-submit Career Opportunities to the iTunes Podcast Directory, I also found that my GoDaddy Shared Hosting did not provide the byte-range request feature that iTunes now required to register a podcast. This set in process a whole series of actions which have now all been completed. This post is an attempt to catalog what I needed to do to repair the situation and put my web site and podcasts on good footing for the future. First, I needed to find a new web host that could support podcasting, hosting my own media files and also 5 WordPress blogs. Based on the recommendation of (fellow Friends in Tech member) Steve over at the GeekCred podcast, I decided to move to Dreamhost. I contacted Dreamhost with a few questions and they confirmed they did indeed support byte-range requests on their server and could also deal with the more the 20GB of data that make up my web site. One Dreamhost feature that made my web site move easier than ever before is that they support shell access for their web hosting accounts. This means I am able to login to a command line on my web host and use that command line for various functions. In my case, this meant I could use the WGET command to mirror my entire web site directly from my GoDaddy server to the new server. The reason for doing this, of course, is speed. To upload just one podcast, A Gardener’s Notebook, from my home computer to the new web host was estimated to take almost 7 hours at the full speed of my cable Internet connection. Because the web servers are on higher speed connections, though, I was able to move the files directly between the web hosts at 3MB/sec and accomplish the entire move in about 1.5 hours. This dramatic difference made me realize how critical shell access is to anyone is who moving their web site to a new host. I understand from others that Dreamhost is one of the few web hosting companies that provides shell access, but I would find this to be a critical need for any podcaster who hosts their own media files. We simply have too much data to be troubled by uploading our entire library from a standard Internet connection. Since I have 5 WordPress blogs on my site, after all the static files had been moved to the new web host, it was time to consider moving all the databases that hold the content for these blogs. This is not something I am experienced with, so I called on another Friends in Tech member, Kreg from the Technorama podcast, to help me move those files. Kreg wasn’t available immediately, so I began to poke around in the process and see if I might be able to do it myself. As it turned out I was able to export all the data from the old system and import it into the new. A few quick changes to each wp-config.php file on the blogs and I found that everything was working on the new site. It was a great learning exercise and also means I won’t be so leery of moving databases in the future. Once again, Dreamhost’s Control Panel and help files made it a straightforward and easy process. First, as a word of warning, if your podcast is dropped from the iTunes Podcast Directory, you will be able to re-submit it, but all your ratings and reviews will be lost. Your podcast will also receive a new, different, ID number and link in the iTunes Podcast Directory. This could be quite damaging for a particularly popular podcast, so do everything you can to make sure it doesn’t happen to you. Mainly, make sure that iTunes can easily and regular access your RSS feed. In my case, it appears that GoDaddy is doing such aggressive traffic management that external services like iTunes, Feedburner and others are refused connection to your web host on a regular basis. I found this to be especially true when trying to re-submit my podcast. I would get 10-12 error messages of Connection Reset before iTunes was able to access my RSS feed. Conversely, when re-submitting from Dreamhost I received no Connection Reset errors. iTunes immediately recognized my feed. One big issue when re-submitting your podcast is that you cannot submit the RSS URL that you are currently using for your podcast. If you do, iTunes will tell you that it is a duplicate podcast. Instead, I took my existing RSS feed, saved it to a static file (in my case, I named it index-fix.xml) and then stripped out all by a few podcast entries. Then I used this URL to re-submit the show to iTunes. Since my feed already contained all the appropriate iTunes XML entries (since I use Blubrry Powerpress to generate the feed) iTunes recognized all the settings and re-addded the podcast. Career Opportunities then reappeared in the iTunes Podcast Directory in about 1 day. Of course, you should use your own RSS URL in place of mine above. You place this tag immediately after the <CHANNEL> tag in the RSS file. I edited the index-fix.XML file and added this tag using a text editor. Within an hour or so, iTunes had seen this change and re-pointed the iTunes Podcast Directory listing back to its original feed. On my web site I had quite a few email aliases and 2 subdomains on my old web host. Remember that these will need to be set up fresh on your new web host. I prefer to set all of this up before pointing my domain name at the new site. Every web host will provide you a temporary domain name for your new site so that you can test out nearly all functions before “throwing the switch” to send everyone over to the new web host. In my case, everything seemed to be working well at this point, so it was time to reset the DNS servers to point to the new web host. In my case, my domains will remain hosted at GoDaddy for the time being, although I will probably move them in the future. I prefer to take one step at a time so I don’t create multiple problems for myself. The process of moving is complicated enough without adding additional, simultaneous issues on top of it. Dreamhost provided me with the IP addresses for their Domain Name Servers so I only had to visit GoDaddy and enter those numbers for each domain to point it away from GoDaddy’s web servers and off to Dreamhost’s. It can be a bit difficult to tell when the switch over has occurred as, ideally, the sites should function in exactly the same way. In my case, I added a small notice to my home page telling visitors that I was moving web sites. I only added this note to the front page of the new web host. Every so often I would reload my main page in my web browser. When I saw that the page included the web move notice, I knew I was looking at the new web host and not the old one. Within about an hour I noticed that visits to http://welchwrite.com were already pointing over to the new web host. I has now been about 3 days since I made the move and I am quite happy with how it worked out. The new web host at Dreamhost seems a bit faster and, more importantly, it doesn’t seem to throw up the Connection Reset errors I was seeing with GoDaddy. I have also noticed that the listings for my other podcasts now have been updated and include the appropriate logos and a current list of episodes available. I am fairly confident now that I shouldn’t have any on-going issues with my podcast listings down the road. If you have any questions or comments about my experience, please add your comments below. I would love to hear them! This entry was posted in Blogging, New Media, Opinion, Podcasting, Projects, Real World Example, Special, technology. Bookmark the permalink. One question – couldn’t you have just redirected your rss feed for your podcast to a different server or used a service such as feedburner? I prefer to host my own files locally rather than have them at, yet another, site that I have to manage and that leads to some issues, for sure. Mainly the fact that I have 20GB of web site I have to shift around on occasions like this. Thank goodness it doesn’t happen that often. Being that I host my own files, moving all the media files to a host like Libsyn would have been a problem since I would have also had to try and redirect all my links in all the associated pages. With such a back catalog of podcasts it really makes things difficult. Feedburner would not help as iTunes was complaining about the hosting of the media files themselves and not the RSS feed. The lack of byte-range request on the GoDaddy server meant I couldn’t even re-submit the feed to iTunes until that was resolved. That said, I moved off Feedburner a year or more ago as it couldn’t seem to access my source RSS feed (I am assuming because of the Connection Reset errors) so it couldn’t update when I posted something new to the blog. These issues make me wonder how much traffic wasn’t making it to my web site at all, actually. The Connection Reset issue seemed to be mainly confined to automated requests from iTunes, Feedburner and others, but it does make me wonder. I didn’t say it in the post, but I would also suggest that any podcaster who uses GoDaddy’s Shared Hosting could be at risk. They won’t notice it until they fall out of the podcasting directory, but then it will create a large issue like I have experienced. For example, I just noticed that both Technorama and Gmail Podcast are missing their logos in the iTunes Podcast Directory. When this happened to me, I thought it had to do with no having the new 1400×1400 logo graphics. What I found, though, was that once I moved to the new web host my logos came back. I think this could be a sign that iTunes is having difficulty accessing the GoDaddy web site. I need more info to be sure, though.